At the hotel in Hyères-Les-Palmiers, we do not skimp on strong emotions. 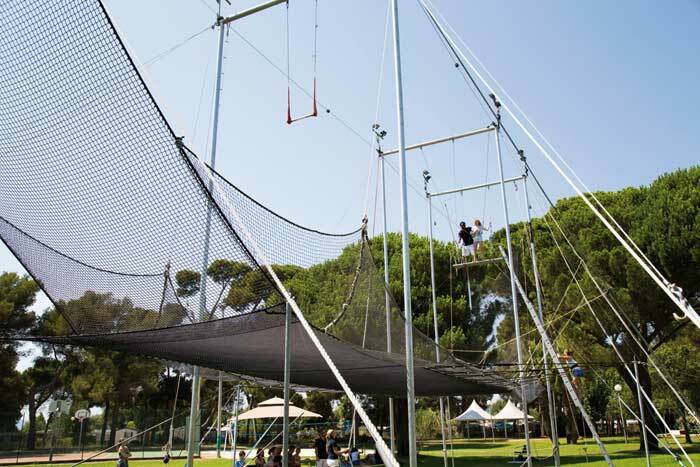 Throughout the summer, circus entertainment, and particularly its flying trapeze, attracts visitors. Who has never dreamed of making somersaults in the air in front of the “star track”? In Plein-Sud it is possible! Regardless of their age and in complete safety, vacationers can enjoy the high-flying exercises that trapeze artists perform. At the beginning of each week, the circus and trapeze flying school “Circus Resort” gives a demonstration in the club’s premises. They fly 10 meters high under the stunned eyes of all. If adults look with respect and a little apprehension, children – they – dream of only one thing, to climb and fly away into the air. For professionals, it is an opportunity to discover the discipline and present the circus workshops that will take place throughout the week. This is the case for about ten children who, every week, come to learn the trapeze or simply to overcome their fear of emptiness. If the daily workshops are intended for them, the test is open to all. After the anguish of the first time, the pleasure and the impression of flying quickly become addictive. Perched 10 metres high, the children of Plein-Sud had only one idea in mind: to start over. With each passing, they feel lighter and more skilled. Each time, the team of professionals explains and provides valuable advice. The vocabulary is precise and the security is at its maximum. So much so that at the end of the week, children are able to perform complex and impressive figures. 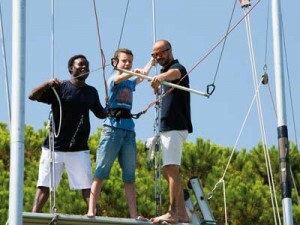 Every day, from 3 p.m. it is the crowd on the site where the flying trapeze is installed. In the small tail that forms at the foot of the structure we meet many children. If some parents play the game and willingly give it a try with their children. Others remain on the reserve and are a little more anxious to see their offspring flying in the air. In any case, in the assistance at each passage, the tension is palpable and it is the admiration that can be seen on all faces! Pierre’s muscles, Bastien’s father, contract when his son steps onto the platform… After a safety check at the bottom and then at the top of the structure, Bastien, 12 years old, can finally take off. He manages to carry out a “catch” (passage from the trapeze to the wearer’s arm) under the anguished but proud eyes of his father!